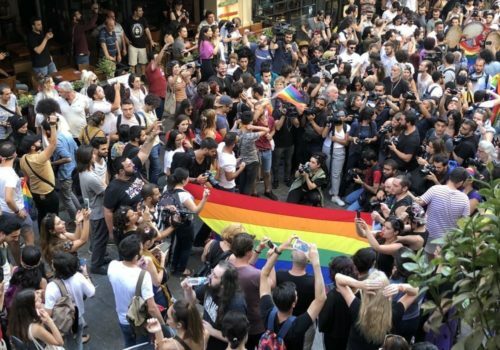 Turkish authorities may have banned Istanbul Pride for the fourth year, but a thousand people still gathered on Sunday before police dispersed them and arrested 11. The Agence France-Presse news agency reports that people gathered near Taksim Square, where organizers wanted to have the parade. They unfolded a large rainbow flag amid heavy security. But police then used rubber bullets and tear gas, and they detained 11 protesters. Amnesty International in Turkey demanded the 11 should be released immediately. Istanbul Pride had grown tenfold, from 10,000 people in 2011 to 100,000 in 2014, as it became the largest Pride in a Muslim-majority nation. While homosexuality is not illegal in Turkey, homophobia is common. Turkey had once bid to become a member of the European Union, but its government is now controlled by conservative Islamic forces. In November 2017, the Istanbul governor banned LGBTQ events. AFP reports it had told this year’s Pride organizers that it couldn’t ensure their safety — even though it had dispatched hundreds of police. One protester told AFP that the government is afraid. “People are not afraid. Shopkeepers are not afraid. However, the governorship is afraid, the police are afraid. They think that they can restrain freedom with the barricades they set up and the tear gas,” the activist said.